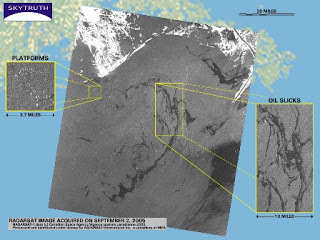 Speaking of oil spills, SkyTruth images revealed significant spills covering a large area of the northern Gulf of Mexico in the wake of Hurricane Katrina back in 2005. At the time, nobody was talking about what had happened to the 4,000 offshore oil platforms – and 34,000 miles of pipeline on the seafloor – when Katrina ripped through the Gulf as a Cat 5 storm, followed a few weeks later by Hurricane Rita. Attention was rightly focused on the unfolding human tragedy, as well as the 7-9 million gallons of oil spilled from damaged pipelines, refineries and storage tanks onshore. But for months after the storms, officials from government and industry repeatedly claimed that there were no “significant” spills in the Gulf. That line is still heard even now. Yet in May 2006, the U.S. Minerals Management Service published their offshore damage assessment: 113 platforms totally destroyed, and – more importantly – 457 pipelines damaged, 101 of those major lines with 10″ or larger diameter. At least 741,000 gallons were spilled from 124 reported sources (the Coast Guard calls anything over 100,000 gallons a “major” spill). Wells and platforms were shut down before the storm, so leakage from those facilities was minimal. Pipelines were shut down too. But what the officials failed to mention is they don’t require industry to “purge” pipelines before a severe storm – so they were probably still loaded with oil, gas or liquid gas condensate. Any section of pipeline that was breached leaked all of that product into the Gulf within hours of the storm. That’s what we think accounts for the widespread slicks seen on the imagery from September 1 and 2, covering hundreds of square miles and obviously emanating from many points of origin. 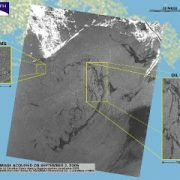 These slicks dispersed after several days of high winds offshore, as shown by our followup imagery taken on September 12, but a few problems remained as evidenced by ongoing leaks from wrecked platforms. This report from MMS details the pipeline damage that occurred. operators and submitted to the MMS. were typical of this historical experience. Your article misrepresents the report. Evidently offshore drilling is safer than transporting oil in large tankers. Det Norske Veritas (DNV), the contractor that the U.S. Minerals Management Service (MMS) hired to review pipeline damage from Hurricanes Katrina and Rita, used 1-1/2 pages of their 104-page report to address the environmental impacts. In that brief section they reiterated what MMS had already made public: spills from Hurricane Katrina (233,108 gallons) and Hurricane Rita (508,204 gallons) put 741,000 gallons of liquid hydrocarbon (oil, and natural-gas condensate) into Gulf of Mexico waters. DNV’s report doesn’t mention who characterized this event as “minor.” The U.S. Coast Guard is the lead government agency for enforcing the Clean Water Act, and they classify any oil spill over 100,000 gallons as a “major” spill. We conservatively stuck to the damage and spill numbers MMS reported, even though the goverment has no independent way to inventory how much oil and condensate leaked out of more than 450 damaged pipelines. Shutoff valves prevent spills from oil and gas production wells, but they can’t prevent a broken section of pipeline or riser from leaking its product into the sea. The DNV report doesn’t mention this, yet a 10″ pipeline segment that’s 5 miles long between shutoff valves can hold more than 100,000 gallons of oil. If it breaks, that oil is going into the water. Nobody is publicly addressing this issue, because it takes time (and money) to purge all of the oil or condensate out of a pipeline when a storm is coming, and to safely restart that pipeline once the threat has passed. New regulations that MMS adopted this year to ensure drilling rigs “stay put” during storms should help, since many of the pipeline breaks were apparently caused by runaway drilling rigs that broke loose and drifted across the Gulf, dragging their anchors along the seafloor. But there are other causes of pipeline failure during storms. As long as purging is not required, then MMS is essentially accepting the inevitable pollution from storm-caused pipeline failures as an unfortunate cost of doing business. Because these are public waters at risk, and public resources being lost, it seems to me that the public might want to know about this. No doubt, it might have been worse in the offshore. Nobody was hurt or killed, a remarkable achievement. But some people may decide that hundreds of thousands of gallons spilled into the Gulf is more than just a minor pollution event. Help! What page of that report mentions the 741,000 gallons? Table 2 on page 27 of the Det Norske Veritas report for MMS summarizes the spills caused by damage from Hurricanes Katrina and Rita to offshore facilities. They give the totals in barrels; there’s 42 gallons in a barrel. Platforms and drilling rigs accounted for 10,365 barrels (435,330 gallons) spilled. Pipelines spilled another 7,287 barrels (306,054). That’s a total from both storms of 17,653 barrels (741,384 gallons). the mentality of the offshore oil companys is "if no one tells then no crime has been committed "
anychance this might be a relevant article today? with rigid extremely heavy steel member /frame around base periphery to hold in position and shape, inflate enough to float to site, deflate on a controlled basis to cover well site, draw off captured oil.